Mix the salt, sugar, cumin, pepper, chili powder, and paprika together and rub well into the spareribs. Preheat the oven to 300 degrees, and place in a roasting pan in one layer. Bake, pouring off accumulated fat every 30 minutes or so, for about 2-3 hours, or until the ribs are cooked (if you are in a hurry, cover the roasting pan with aluminum foil). 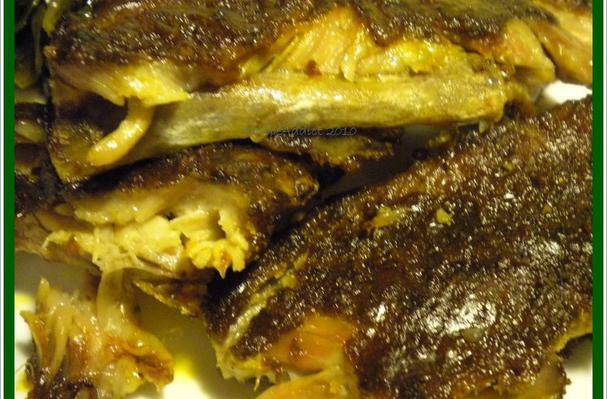 When you are ready to eat, roast the ribs at 500 degrees F. for about 10 minutes, or run them under the broiler, watching carefully, until nicely browned.